The Kuber Yantra is as powerful as a fully energized Kuber Murti. 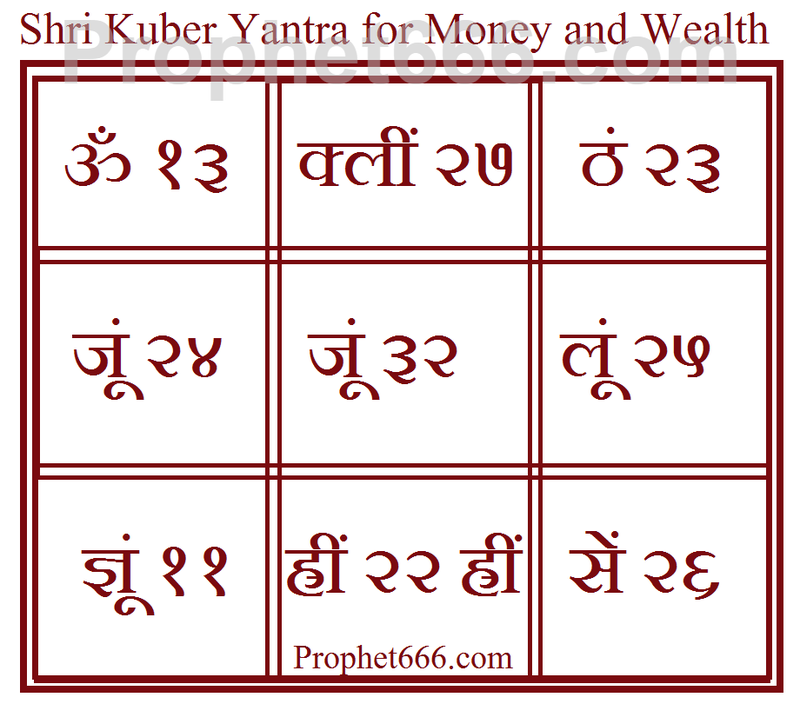 The sincere worship of the Yantra will remove all monetary problems and obstacles from the life of the practitioner and make his or her life happy and tension-free. 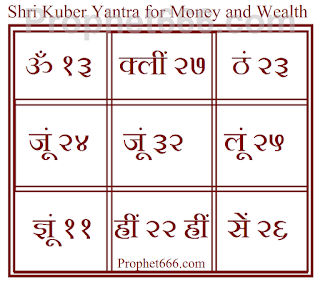 1] The Kuber Yantra should be prepared during any auspicious occasion falling on a Tuesday. On this day, the practitioner should have a bath at midnight and wear red colored clothes, while preparing the Yantra. The Tuesday falling during the festival of Navratri is considered to be the most auspicious occasion for making this Yantra. 2] A mixture of Rakt-Chandana, Keasr, Gorochana, Kasturi and Ashtagandha should be prepared by adding a few drops of water. 3] Then, using an Anar Kalam, the practitioner should draw the Yantra[an example is shown in the image] on a Bhojpatra, using the mixture as the ink. 4] Then, the practitioner should sit down facing the west direction and place the Kuber Yantra, in-front of him on a red aasan. 5] Then, the practitioner should offer Rakt-Chandana and red colored flowers to the Kuber Yantra and light Dhoop and Deep in-front of the Yantra and offer a Naivedya of sweet dishes. 6] Then, the practitioner should chant the Kuber Mantra shown in the image 5000 times on the first night and thereafter 1000 time every subsequent night. Only women having their monthly cycle can take a break during the course of the Mantra Sadhana. 7] The Kuber Yantra will become fully energized and infused with the power of the Kuber Mantra when 200,000 Mantra Chants are completed. 8] After the completion of the 200,000 Mantra Chants, the practitioner should offer lunch and some money to any unmarried girl. After this, the Kuber Yantra can be kept in the Puja-Place and worshiped. Kasturi(Musk) is not available in markrt, can you suggest something else in place of kasturi? 1. At which time in night the rest of 1000 mantra should be recited. 2. Any daily specials poojan. 3. Will any thing happens scary or any such kind of experience. 4. Any rules to be followed. 5. Which type of mala and aasan should be used. 1. After Midnight as is the first part of the Mantra Sadhana. The rest of the things are not important, you can use any Mala and Aasan, including a Rudraksha Mala. Raktachandan and Gorochana not available in market.